Winner of the Rockin' Green Prize Pack is....Carrie from DangerousCrayon! Carrie is the mama behind the blog DangerousCrayon. Please stop by her blog, say hello, and congratulate her on her win! Thanks again to Rockin' Green for sponsoring such a great giveaway. 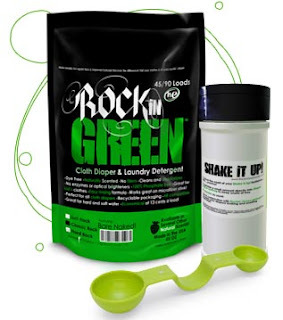 I'm so excited to have won the rockin' green - I really interested in the pail freshener, and I know I'll love the detergent!